Over the weekend, a great deal of artists descended on Los Angeles for the latest edition of FYF Fest. Among them was everyone's favourite soft rock crooner Mac DeMarco, who brought a very special guest onstage with him. 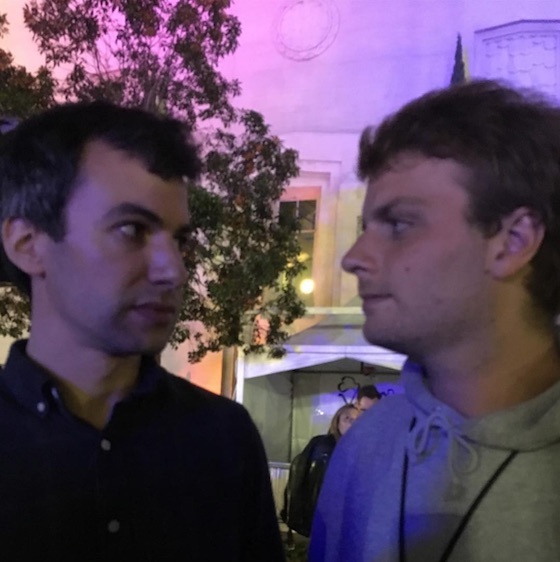 Gonzo comedian and Nathan for You host Nathan Fielder had appeared on DeMarco's Instagram earlier that day, but their bromance continued when the pair teamed up for some musical antics onstage. According to Mat Mag [via Consequence of Sound], Fielder spent his time onstage scrolling through his phone, endlessly tuning his guitar, lighting and putting out cigarettes and, to top it all off, smooching DeMarco's crotch. Watch some fan-shot footage of this epic team-up below.